IT’S A STARFISH WORLD. YOU NEED TO PAY ATTENTION. Spiders and starfish may look alike but there is something miraculous about a starfish. Cut off the leg of a spider and you have a seven-legged creature. Cut off its head and you have a dead spider. But cut off the arm of a starfish and it will grow a new one. Not only that – the severed arm can grow an entirely new body. Starfish can do this because, unlike spiders, they are decentralized; every major organ is replicated across each arm. Starfish don’t exist only in the animal kingdom. Starfish organizations are taking society and the business world by storm, changing the rules of strategy and competition. Like starfish in the sea, starfish organizations are built on very different principles than traditional organizations. Spider organizations are centralized and have clear organs and structure. You know who is in charge. You see them coming. Starfish organizations are based on completely different principles. They tend to organize and arise quickly around a shared ideology or a simple platform for communication – think al Qaeda or Alcoholics Anonymous. These platforms can be easily duplicated, facilitating the rapid spread of ideas. And the Internet is helping them flourish. How did Toyota leverage starfish principles to crush its spider-like rival GM, which had to seek a bailout to survive? How did tiny Napster cripple the global music industry? How did the Tea Party and Occupy Movements take the national stage and shift the direction of American politics? Why is free, community-based Wikipedia crushing Encyclopedia Britannica? Why is tiny Craigslist crippling the global newspaper industry? How is Twitter reshaping global news and governments? Why, despite the death of Osama bin Laden, is Al Qaida flourishing? The answers lie in the structure and strengths of starfish organizations. Starfish organizations can be massively disruptive, but for better or worse they are here to stay. 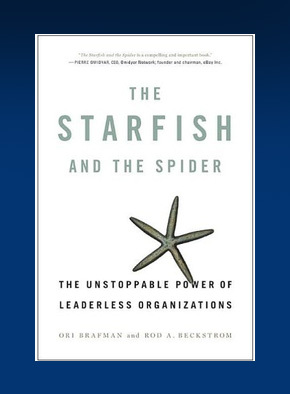 The Starfish and the Spider by Rod A. Beckstrom and Ori Brafman explores the phenomenal and unstoppable power of starfish organizations. It will change the way you see the world. The Starfish and the Spider is great reading. [It has] not only stimulated my thinking, but as a result of the reading, I proposed ten action points for my own organization. The Starfish and the Spider is a compelling and important book, rich with examples of how decentralization is fundamental to what I call the ‘right environment’–one that promotes equal access, rich connections and ‘skin in the game’ for participants. Pierre Omidyar, CEO, Omidyar Network; Founder and Chairman, eBay Inc.
Starfish lifts the lid on a massive revolution in the making, a revolution certain to reshape every organization on the planet from bridge clubs to global governments. Brafman and Beckstrom elegantly describe what is afoot and and offer a wealth of insights that will be invaluable to anyone starting something new–or rescuing something old–amidst this vast shift. Starfish challenges the command and control economy with the power of participatory consumers. From eBay to Google, Skype to Craig’s List, inspired individuals are catalyzing a marked shift from hierarchies to the wisdom of crowds. Ori and Rod provide sharp insights into how to avoid becoming the next victim of this market populism; or if you are so inclined, the strategies to take on those vulnerable incumbents. A fantastic read. Constantly weaving stories and connections. You’ll never see the world the same way again. The Starfish and The Spider presents a new and clear lens for viewing and understanding the tremendous changes underway in the television, film and music industries. The new model it presents is valuable for anyone involved in a management or production capacity. New starfish-like networks have changed the landscape and this book shows all players how to leverage the new powers of these networks. This book is a quick and enjoyable read that will prove itself to be essential to anyone in the industry. A must read. Starfish are changing the face of business and society. This page-turner is provocative and compelling. I just read The Starfish and the Spider a second time. I am writing a Board paper asking my Board to approve a completely new top management structure. I have borrowed heavily from your thoughts, and feel even in an age-old bricks and mortar industry, we can apply some of the leaderless organization rules to grow faster and be significant to our members and our communities. It is my pleasure to endorse The Starfish and the Spider by Ori Brafman and Rod Beckstrom. Reading The Starfish and the Spider is like jumping into the minds of two visionaries who can see possibilities for our world that others can not hope to even imagine. But the great thrill of this book is that these two authors are visionaries who have already achieved extraordinary accomplishments in this world – they know how to make visions incarnate. That’s why you need to read this book. They see the world the way it can be. The Starfish and the Spider, like Blink, The Tipping Point, and The Wisdom of Crowds before it, showed me a provocative new way to look at the world and at business. It’s also fun to read! It’s a quick read, but a profound one. Every CEO should think about what aspects of catalyst leadership they embody, or can embody, for the good of their company. Starfish provides a powerful perceptual prism for understanding the patterns and potential of self-organizing systems. In addition to being highly readable and highly entertaining, Beckstrom and Brafman make a strong case for the leaderless organization, an approach that is too often unappreciated in today’s world. The Starfish and the Spider is an intelligent and compellingly written exposition of the importance of decentralization in our lives, culture and economy . The authors’ weaving of neurochemistry with economics sociology and psychology entertained and educated me and will do the same for anyone who wants to learn. Starfish represents an important framework for understanding and mastering distributed leadership. How do you *think* about running your organization in a world where customers openly share their opinions of your business without you controlling the dialog? Is your mentality starfish or spider driven? Read about insightful examples and consequences of paths companies, governments, and social groups have pursued. I wish I would have read this book before fighting with my fellow Marines in Fallujah. If we are going to realize any success in our countrinsurgencies around the world, we had better do more to understand our adversary. Drawing on both the public and private sectors, Starfish and the Spider develops a fascinating paradigm. It is a must read for any officer seeking new approaches for unconventional war. Before I read The Starfish and The Spider, I often felt like I was bobbing alone in a sea of old ideas in how I chose to manifest and guide an organization or project. Now my instincts are affirmed and I go forth with greater insight, confidence and words to articulate my ideas. And of course, I am on the lookout for other starfish. This book explains clearly and simply the power of decentralized organization. If decentralized organization sounds like an oxymoron, read on! This is a powerful new organizational model and Brafman and Beckstrom demonstrate how and why it is taking industries by storm. Steve Farrell, Worldwide Coordinating Director Humanity’s Team Former CEO, Enterprise Networking Systems Inc. This is one of those books that is so striking, that I keep bringing it up in conversations. As the head of an international nonprofit, the insights into non-hierarchical organizations are not just valuable, they’re essential to our work in the future. 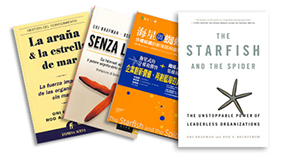 I’d suggest adding to the list the upcoming The Starfish and the Spider: The Unstoppable Power of Leaderless Organizations, by Ori Brafman and Rod Beckstrom. It’s another great look at how we can often be more effective by subverting hierarchy rather than following it.